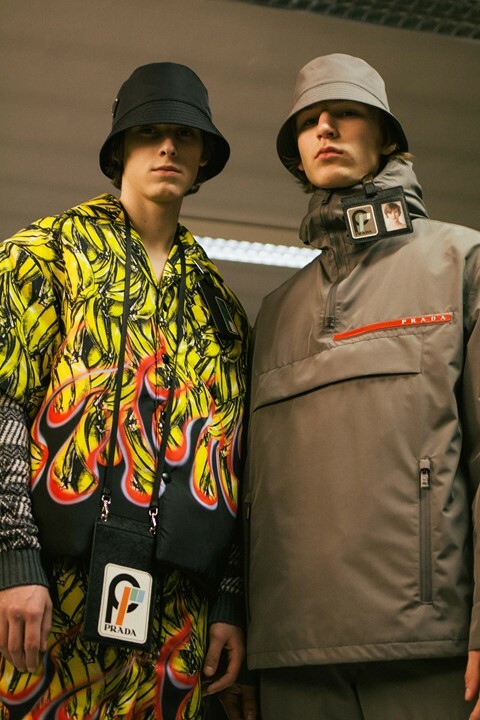 Back in January, at the AW18 Prada menswear show, Miuccia Prada revealed her first clue that Prada Linea Rossa – the Italian brand’s defunct, sportswear-inspired line – may be making an imminent comeback. Not only was the collection nylon-heavy, incorporating padded shirts and bucket hats made from the house’s signature fabric – a precursor to the AW18 womenswear show that would follow the next month – but, midway through, several pieces of outerwear bearing a familiar red rubber strip made an appearance. Among them, was a black, knee-length windbreaker worn by Paul Hameline, and a white iteration modelled by Rianne van Rompaey. The red strip was recognisable as the logo emblazoned on Prada’s techy, nylon garments in the late 90s and early 00s, and sure enough, true to Mrs P’s cryptic word, a few weeks ago its return was officially confirmed. The label’s coveted ‘Red Line’ – or Prada Sport as it’s perhaps better known – is back for AW18, as seen (for the most part) across the highlighter pen-hued styles that permeated the season’s collection. Just as Prada was wise to tap into the futuristic optimism of the 1990s – when technical fabrications and minimalist silhouettes became a wardrobe must-have as popular culture moved towards the new millennium – it is an equally intelligent move to revive its youthful line in 2018. Today, the word athleisure is ingrained into fashion’s lexicon, and favoured for its ungendered and unfussy approach to dressing. So, to mark the covetable line’s reinstatement, we break down the history of Prada Linea Rossa. In 1970, Miuccia Prada joined her grandfather’s leather luggage company, before she eventually took over the business in 1985. Although Mrs Prada had already begun to use nylon fabrications in the early days of her tenure, creating the lightweight, black Pocone Nylon that is now a Prada staple, it wasn’t until the release of the iconic backpack in 1985 that the house developed a cult following, though, which ultimately transformed it into the brand we know and love today. For Prada’s AW94 collection, Miuccia Prada looked to Pocone accessories as inspiration, creating dresses, jackets and vests similar to the pieces shown in the AW18 show. 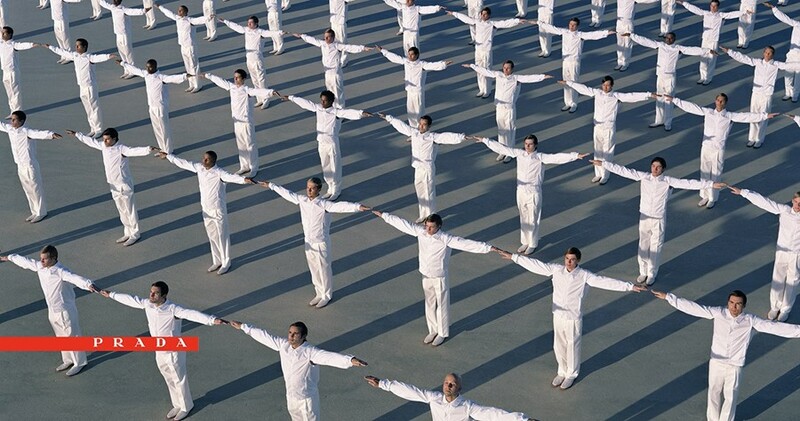 Certainly, the AW94 collection marked the beginning of Prada’s move towards the conception of Prada Sport. In the early 90s, young designer Neil Barrett – who had just finished a stint at Gucci – wrote to Prada’s CEO Patrizio Bertelli, suggesting that the house should launch a menswear line, and that he should be the one to head up its team. Such bravado paid off: he was appointed to the role, and in 1995, Prada debuted its first collection for men, as designed by Barrett. This solidified the high-tech, minimalist aesthetic that became the mainstay look of Prada Linea Rossa when it launched two years later in 1997. Such was its success, that tor SS99, Miuccia Prada translated the codes of Prada Sport into her mainline womenswear show – including angular belt-bags and elasticated pouchettes worn on the calf – satiating fashion’s appetite for clothes displaying that little red line. The Prada AW98 campaigns shot by Norbert Schoerner are nothing short of iconic – depicting Angela Lindvall in a surreal desertscape, contorted into various poses, tripping out of clunky grey Mary Janes and hunched over in a red satin twinset. Prada Sport’s groundbreaking equivalent were the campaigns photographed by Phil Poynter, styled by David Bradshaw and art directed by David James. 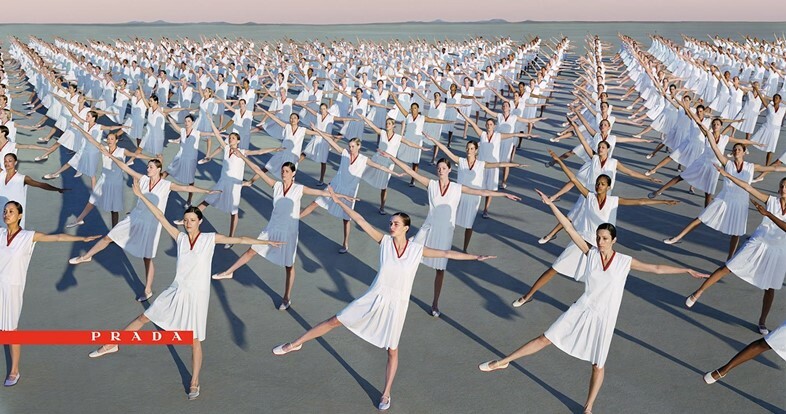 One of the most arresting of the series is the SS01 campaign, which is instantly recognisable by its uniform arrangement of around 150 models – limbs elongated as though in mid-stretch in an exercise yard – wearing identical, white, drop-waist tennis dresses. Prada Linea Rossa has already made a convincing case for the necessity of its comeback. Not only have the likes of Kanye West, A$AP Rocky and Dazed AW18 cover star Dev Hynes been spotted wearing pieces from its new collection, but the house also employed stylist Lotta Volkova to bring life to its latest campaigns. Volkova is long-time collaborator with Demna Gvasalia and holds a stake in the buzz surrounding cult-brand Vetements – one that is favoured by a younger demographic. Prada seemingly recognise Volkova’s appeal as a voice for the Instagram generation. A technologically savvy audience require equally technologically savvy fabrics, and Prada Linea Rossa AW18 incorporates the use of smart fabrics such as water-resistant Gore-Tex Pro and Nylon 3L (the thinnest membrane in the world). It would seem, that Prada Linea Rossa has begun to realise the kind of future that it could only imagine back in 1997 – it just needed to take a little time off in order to do so.